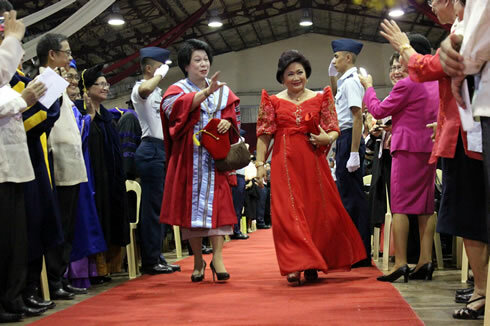 The regal walk of the two remarkable women – Dr. Nona Ricafort (left) and Dr. Milabel Enriquez-Ho (right) during the processional at the Dr. Juanito Bruno Gymnasium. Appointed as the 5th President of the Western Mindanao State University at July 16, Dr. Milabel Enriquez-Ho was officially installed at a formal university-wide ceremony by CHED Commissioner – Dr. Nona S. Ricafort. The formal investiture of Dr. Ho brought together members of the WMSU community to witness another milestone of the university. This historically significant event meant much more than the official beginning of a new administration, it was an occasion that served to recall the university’s esteemed years of academic excellence and of course, to look forward to a more fruitful stewardship with Dr. Ho’s lead. Members of the faculty, staff, students and alumni joined in the celebrations, as well as community leaders, faith leaders, civic and professional organizations, public officials, officials of various universities and colleges and other institutional partners. Among numerous distinguished guests during the ceremony were Aurora Lone-District Representative – Cong. Juan Edgardo “Sonny” M. Angara; Philippine Nurses Association President – Noel C. Cadete; former President of the Philippine Nurses Association – Dr. Ruth Padilla, Zamboanga City State Polytechnic College President – Dr. Nora M. Ponce; Zamboanga State College of Marine Sciences and Technology – Dr. Milavel D. Nazario; Zamboanga City District 1 Representative – Cong. Ma. Isabelle G. Climaco-Salazar; Chief of Staff of Cong. Erico Basilio Fabian – Edgar Ba7ntilde;os; CHED IX Regional Director – Dr. Emmylou B. Yanga; Philippine Association of State Universities and Colleges President (PASUC) – Dr. Ricardo E. Rotoras; PASUC Region IX Chair-Dr. Edgar S. Balbuena; Professional Regulation Commission (PRC) Board of Nursing Chairperson – Dr. Carmencita M. Abaquin; and City Health Officer – Dr. Rodelin M. Agbulos. “I believe that if something is meant for us, a mission for us to fulfill…God will make a way,” Dr. Ho said in her speech after the symbolic donning of the academic regalia, medallion and cap. In her speech, she also underscored once again her 10-Point Agenda, talking about her vision as a president to reach heights in quality education: (1) human capital development; (2) holistic health program for all; (3) vivification of curricular offering; (4) accreditation; (5) linkages and networking with national and international institutions/agencies; (6) modernization of facilities and resources; (7) research informed initiatives; (8) corporate responsibility; (9) resource generation; and (10) energy conservation and environmental and natural resource preservation. Her unique approach as a nurse and administrator at the same time marks her distinct leadership and ideals for the university. “As a nurse I would like to lead the university with utmost care,” she mentioned. Dr. Ho also took the opportunity to thank the partner institutions for tying up with the university and for the projects already accomplished. She is positive and forward-looking for more tie-ups with different stakeholders.